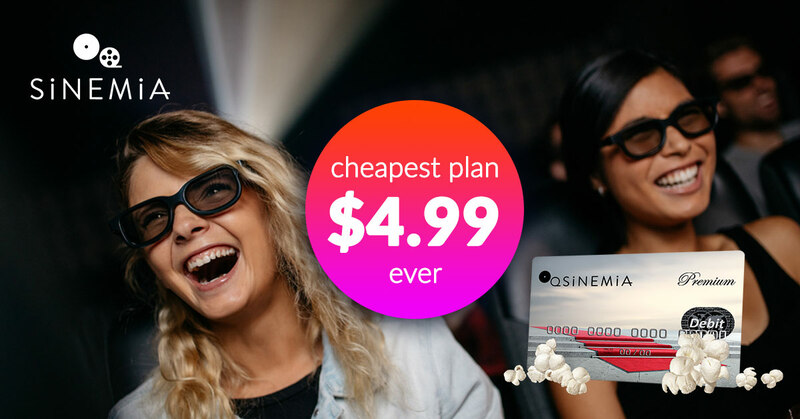 Los Angeles (May 4, 2018) – Sinemia, the leading global monthly movie ticket subscription membership service, today announced new pricing plans that represent the most affordable and flexible movie ticket subscriptions on the market. Sinemia now offers annual subscription plans for as low as $4.99 per month for one ticket and $6.99 for two tickets per month. Sinemia offers tickets to all movies and major theater chains and, unlike MoviePass, includes advanced ticketing and seat selection. All Sinemia monthly movie ticket subscriptions give moviegoers the flexibility to pick any movie in nearly any theater on any date, and to both book their tickets and select their seats up to 30 days ahead of time. The company also offers a highly-intuitive mobile app that includes perks such as restaurant deals, location-based recommendations and more. These new plans are also available in Canada starting at $4.99 CAD a month for one ticket, in the UK for £4.99, and in Australia for $4.99 AUS. Sinemia now brings affordable monthly movie ticket deals tailor-made for the average moviegoer. Sinemia’s one- and two-ticket plans are perfect for movie fans who can’t make it to the cinema every weekend, and contain the flexibility that consumers have come to expect when planning a night out at the movies ahead of time.